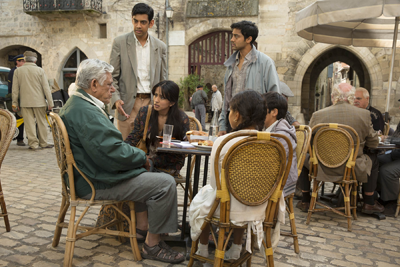 The opening of “The Hundred-Foot Journey” immediately transports viewers to a location evoking all five senses: a bustling, chaotic Indian marketplace where shoppers compete for the best ingredients for their kitchens. A crowd envelops a vendor offering urchins, arguing their case to justify their right to purchase – when the seller stops them all and agrees to sell to the mother of the young Hassan Kadam, who has opened an urchin and is savoring each taste with nearly sensual relish. Hassan is a cooking prodigy, urged on by his mother – the matriarch of the family and the head chef at the family’s restaurant in Mumbai. Following a post-election riot, tragedy strikes and both the restaurant and Hassan’s beloved mother are lost in a fire. The family flees India and heads to Europe, taking refuge first in Holland, followed immediately by England. Deeply unsatisfying attempts to grow roots in their new environs lead the family back to the mainland, this time to France. A chance brake failure strands the Kadams just outside Saint-Antonin-Noble-Val, in the south of France, and the young Marguerite (Charlotte Le Bon of “Mood Indigo”, an amazing ringer for a young Winona Ryder) tows them to town. Le Saule Pleurer’s owner is the taciturn Madame Mallory, a widow with a heart of ice and a burning desire to garner another Michelin star. Madame Mallory is played by the sublime Dame Helen Mirren (“Red”, “Red 2” and – the first place I saw her – “White Nights”), whose failed French accent is the sole flaw in her otherwise fantastic performance. The fully grown and strikingly handsome Hassan (Manish Dayal of “White Frog” and the “90210” reboot) continues to thrive in the kitchen, turning the family’s Maison Mumbai into a destination worthy of attention. With Marguerite a sous chef for Le Saule Pleurer, Hassan and Marguerite find themselves on opposite sides of a quickly simmering war between the two restaurant owners, Papa on one side and Madame Mallory on the other. Hassan eagerly devours the French cookbooks Marguerite snuck over to him, learning the key sauces, ingredients and techniques needed to prepare fine French cuisine. (I’m nearly positive one of them is Le Cordon Bleu Cuisine Foundations , and if Julia Child’s Mastering the Art of French Cooking isn’t one of them – it should be.) 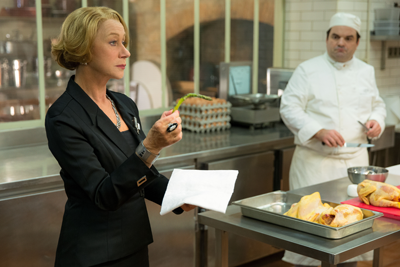 The two young chefs have more and more surreptitious rendezvous, including one where Marguerite confides what is required to prove cooking chops to Madame Mallory. Meanwhile, moves and countermoves by the two restaurants’ generals escalate until a breaking point is reached – xenophobes deface the wall outside Maison Mumbai and set a fire that temporarily injures Hassan. 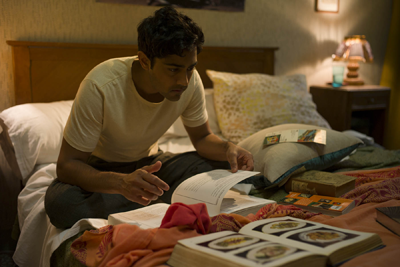 During his convalescence, Hassan manages to break down the divide between himself and Madame Mallory, proving to her that he has the talent to make it in her storied kitchen and finally getting her to admit that he is “more chef than anyone [she] has met.” This begins his personal journey of discovery, not just for Hassan but also for Marguerite, Papa and Madame Mallory. 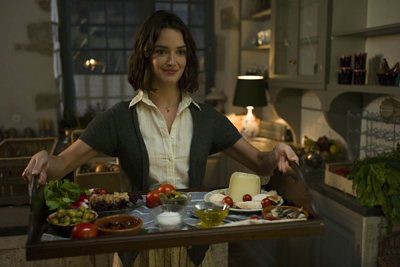 “The Hundred-Foot Journey” is a lovely film, neither too lighthearted nor too depressing. The charm of the south of France is seasoned with beautiful scenes in marketplaces and lush forests, and the time spent in the kitchen seems like a missed opportunity to bring back “Smell-o-Vision”, though lovers of French and Indian cuisines (like myself) can easily imagine the rich scents wafting up from the pots and pans scattered on stovetops in both restaurants. The actors are all superb, although it helps that excellent talent is paired with a humorous, sweet script. My only beefs with the movie, and they’re sized more like an amuse-bouche, are Mirren’s dodgy accent and the fairly maudlin ending. Still, these are insufficient reasons to spurn this film; it was surely one of the best movies I’ve seen in a long time. As far as whether or not to bring kiddos, there are a couple of scary scenes – particularly the two attacks on the Kadam family restaurants – but otherwise it’s a family-friendly movie. Consider “The Hundred-Foot Journey” a very solid investment of two hours and something worth ordering again and again. “The Hundred-Foot Journey” opens nationwide starting August 8, 2014. This movie is rated PG for thematic elements, some violence, language and brief sensuality. 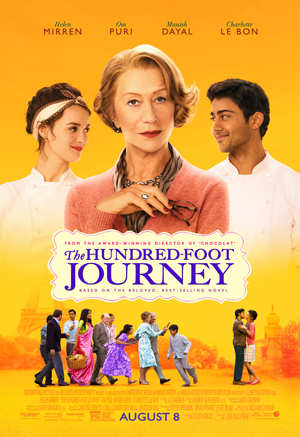 This entry was posted in movie reviews and tagged 100 foot journey, charlotte le bon, helen mirren, hundred foot journey, manish dalal, movie review, om puri by crunchymetromom. Bookmark the permalink. You stole my “maudlin” word for the ending :P. Great review though, I mostly agree with it.